The formation and field-induced switching of defect dipoles in acceptor doped lead titanate is described by a kinetic model representing an extension of the well established Arlt-Neumann model [Ferroelectrics 76, 303 (1987)]. 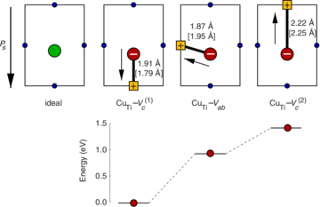 Energy barriers for defect association and reorientation of oxygen vacancy-dopant (Cu and Fe) complexes are obtained from first-principles calculations and serve as input for kinetic coefficients of the rate equation model. The numerical solution of the model describes the time evolution of the oxygen vacancy distribution at different temperatures and dopant concentrations in the presence or absence of an alternating external field. We predict the characteristic time scale for the alignment of all defect dipoles with the spontaneous polarization of the surrounding matrix. In this state the defect dipoles act as obstacles for domain wall motion and contribute to the experimentally observed aging. 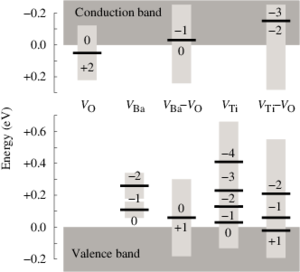 Under cycling conditions the fully aligned configuration is perturbed and a dynamic equilibrium is established with defect dipoles in parallel and antiparallel orientation relative to the spontaneous polarization. This process can be related to the deaging behavior of piezoelectric ceramics.